Painting is a process of applying paints on a surface with the help of different tools. An acrylic paint can be applied on dry and wax free surfaces like vessels, clothes, walls, etc. 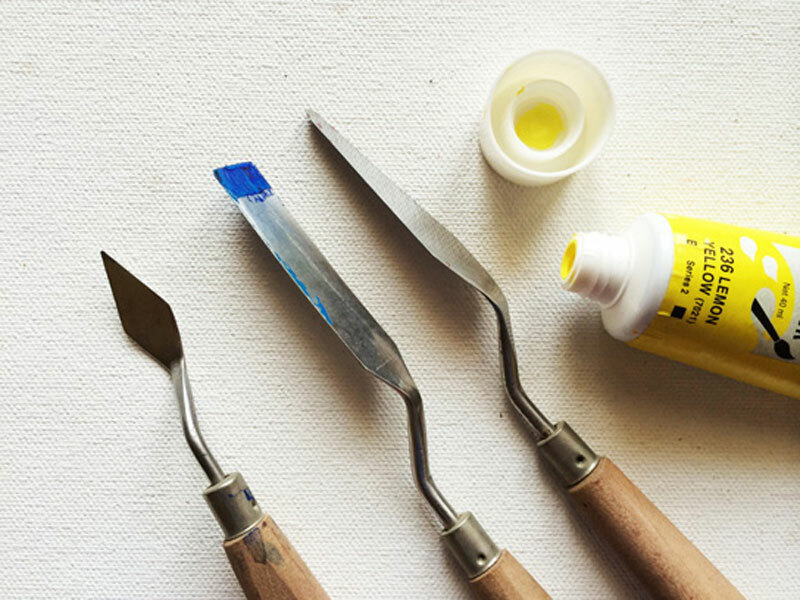 For application of this paint many tools like, brushes, knives, spatulas can be used. There are many types of papers, canvases, and boards available in the market. To start painting, you need few basic colors like titanium blue, black, ultramarine blue, crimson red, yellow ochre. With the combination of these hues, most other paint colors can be made easily. Now a days there are many pre mixed colors readily available in the market. 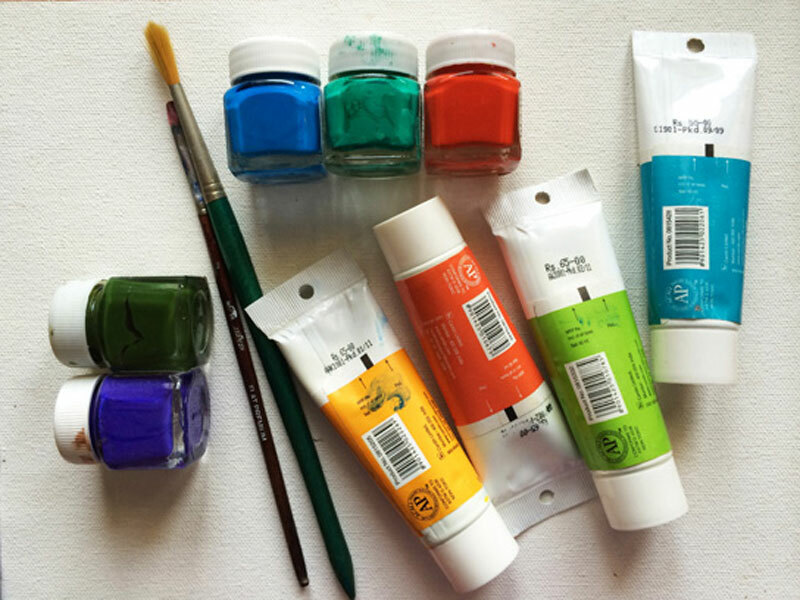 Acrylic paints come in several ranges from beginners to professionals and are available in bottles and tubes. At the beginner’s level it is preferable to buy small quantities in bottle or tubes, each bottle or tube might cost around 20-200 rupees each. There is not much of a difference between bottled and tube colors. 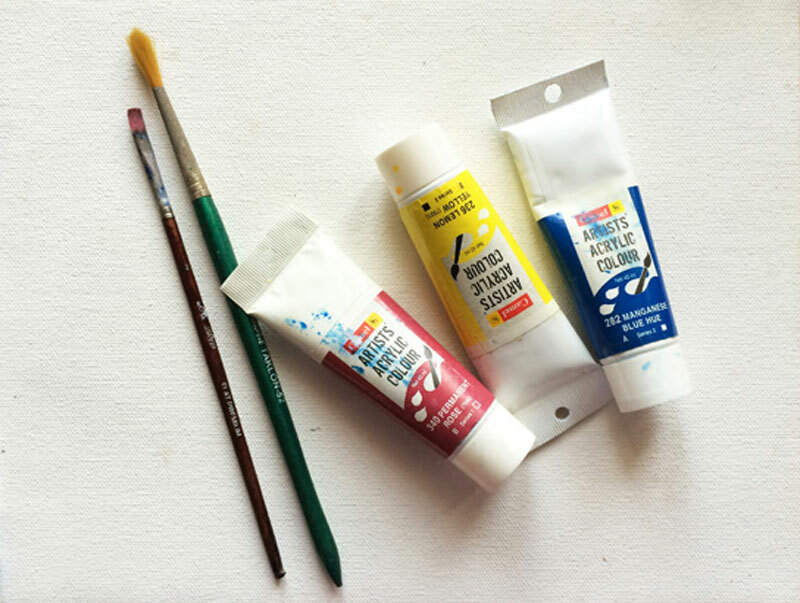 Choosing paintbrushes is a very important step in painting because it can totally change the look and feel of the painting, quality of strokes and texture. In the market there are many types of brushes available. They are mainly categorized into three types-rounded, flat and filbert brushes, depending upon the shape of the brush tip. 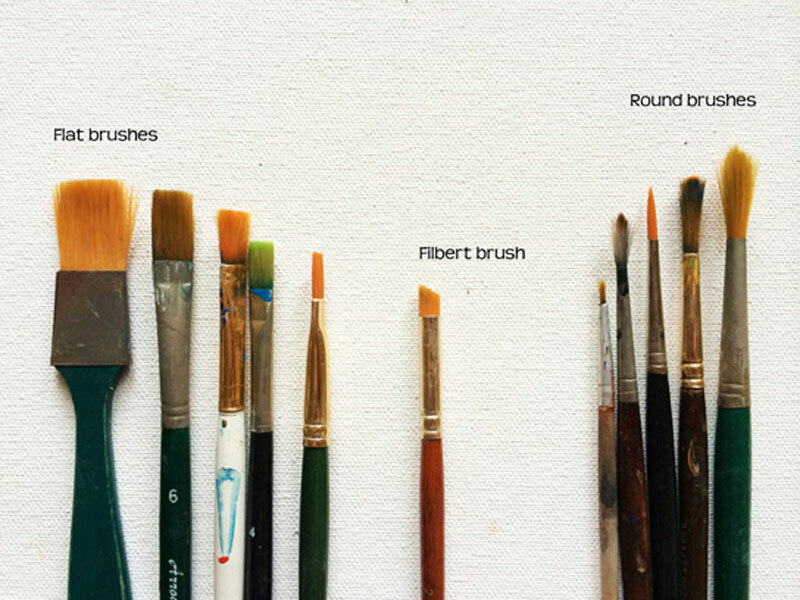 Many different materials are used to make paintbrush bristles, the most common are synthetic and boar hair. It is easier to use synthetic brushes in the beginning, as they are softer, finer, cheaper, and easy to clean. It is better to have different shaped and sized brushes depending on the painting requirement. For example 0 and 1 size round brushes are good for drawing fine outlines and detailing, where as flat brushes are useful in filling wider areas in a painting. To start painting you will need a surface to apply paint on. 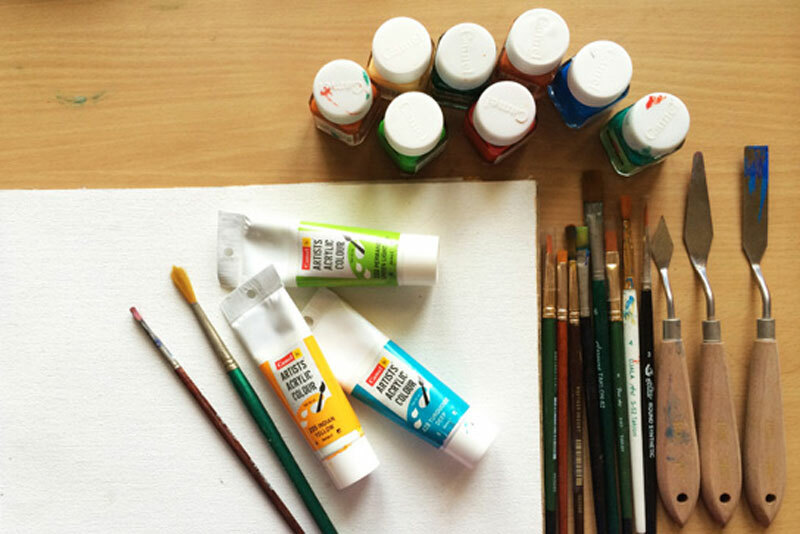 Acrylic paints can be used on just about any surface you like. They provide nice visible textures on canvas. 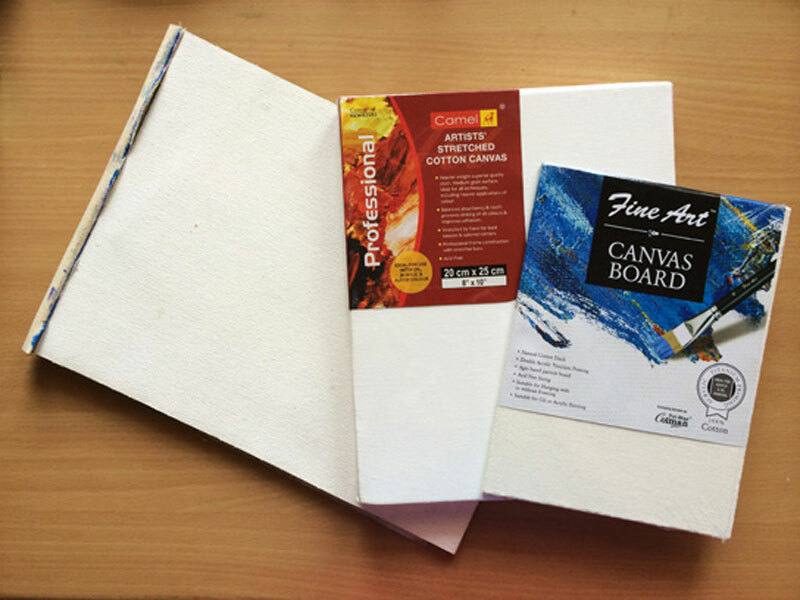 Canvas is available in many shapes and sizes and forms like canvas rolls, pads, boards and frames. Canvas pads and boards are comparatively cheaper than framed canvas. These canvases are already treated and processed and can be directly used for painting. Paper is also an easily available material around us, but for durability, longevity and quality it is better to use canvas for acrylic paintings. Palette knives are made of very flexible steel blade with no sharpened or cutting edge and have a wooden / plastic handle. They are used to mix colors and mediums. Spatulas are comparatively blunt and less flexible steel blades with no sharpened cutting edge and wooden / plastic handle. They are used instead of a brush to apply paint directly on painting surface like canvas. They are available in many shapes, sizes and styles that give different effects and textures. While painting you will need something to mix paints on or to store them for future use. For this any plastic or wooden plate or any wide, flat and clean surface can be used as mixing palette. 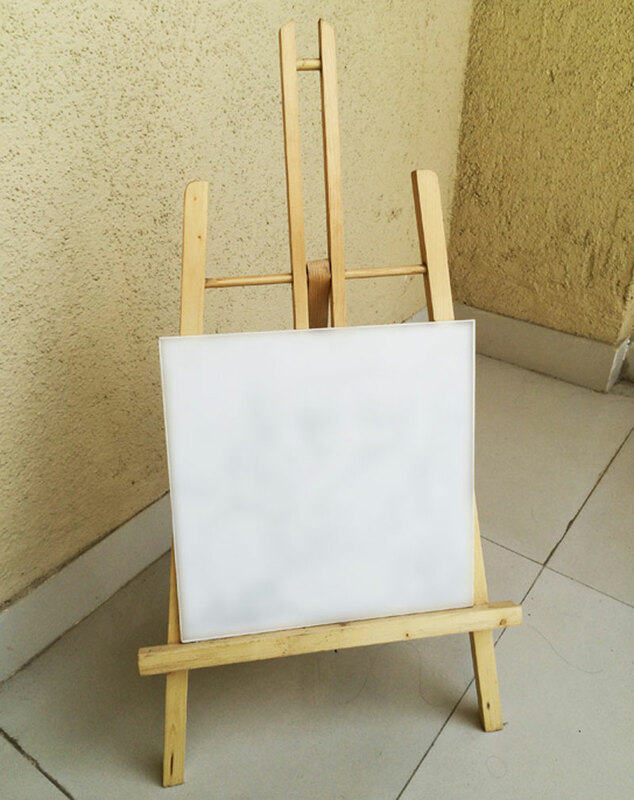 An Easel is a wooden upright support stand specially made for mounting a canvas board while painting.